As Turkey heads towards a dictatorship, standing up for democracy is not just in the interests of the people of Turkey, it is also essential for the future peace, security and democracy of Europe and the Middle East. The first SPOT conference on Turkey took place on 29 October 2016 at the National Union of Teachers (NUT) Headquarters in Euston, London. Over 150 people attended the conference from a range of organisations, with representation from the Turkish and Kurdish community, as well as UK based trade unions, academics, human rights associations, campaign groups and the media. SPOT aims to build a bridge that connects a diverse range of individuals and groups fighting for justice and democratic freedom – both in the UK and in Turkey. Turkey is undergoing a critical period in its history and there is an urgent need to act to support and strengthen the fight for democratic rights and freedoms, and put an end to the breaches of human rights across the country, particularly in the Kurdish-majority regions. This report sets out the key outcomes from the conference and next steps we will be taking in the coming months. We are grateful to all our speakers, supporting organisations and delegates for making the conference possible. We would also like to extend our gratitude to the NUT for hosting us and to Anne Swift, NUT President for further reaffirming their solidarity. We are on the verge of a third world war, and the struggle today is not just about struggling with Turkey. It is about standing up for our collective future. There is a long tradition of joint working between the Turkish and Kurdish communities, progressive individuals and the campaigning organisations in London, not least trade unions and academics. The aim of this conference was to build on and extend these relationships by bringing together key players in the democratic struggle in the UK with representatives from Turkey. During the course of the day we heard from speakers about their aspirations for working together, and how supporting the resistance in Turkey strengthens the ongoing fight in the UK against attacks on workers’ rights and on public services under the pretext of austerity. Trade union and academic representatives sent a message of solidarity, pledging that they would not remain silent as attacks in Turkey on Kurdish people, the freedom of expression, freedom of the media and workers’ rights intensified. There was also a commitment from SPOT to continue actively supporting the struggle of the working class in the UK against austerity and increasing hardship faced by indigenous communities and migrants in the UK. Stressing the connection between war and fascism, speakers from Turkey also shared their observations of developments in Turkey following the attempted coup on 15 July 2016 and the ongoing state of emergency that was declared. It was highlighted that the politics of the AKP is one of war at home and abroad, and that it is in this context that workers’ rights are being trampled on and flagrant breaches of human rights are taking place. Freedom of expression and the media as a means of raising awareness and calling to account such attacks on democratic freedoms was recognised as essential to a functioning democracy. The role that the media have in strengthening the efforts of progressive forces and effective opposition were also noted as key reasons behind the state’s closure of media outlets and scores of academics and journalists being arrested. As a result, the struggle for democracy in Turkey must at its heart be anti-war, which necessitates a peaceful and democratic resolution of the long-standing Kurdish Question in Turkey by the recognition and granting of the long-denied demands and socio-cultural, political and economic rights of Turkey’s Kurds. Together we must join forces so that we maximise our reach and effectiveness when standing up for the fundamental rights of the all minorities, working people and human rights for all. 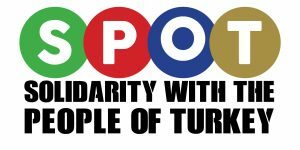 SPOT is a campaign group dedicated to making a real difference to the struggle for democracy in Turkey, and the success of this conference will be judged by the extent to which we are able to bring to life the campaigns and actions agreed. During the course of the conference, we had passionate conversations with delegates both within and outside the workshops on how to take forward our aspirations and work better together as the attacks on democracy intensify in Turkey. 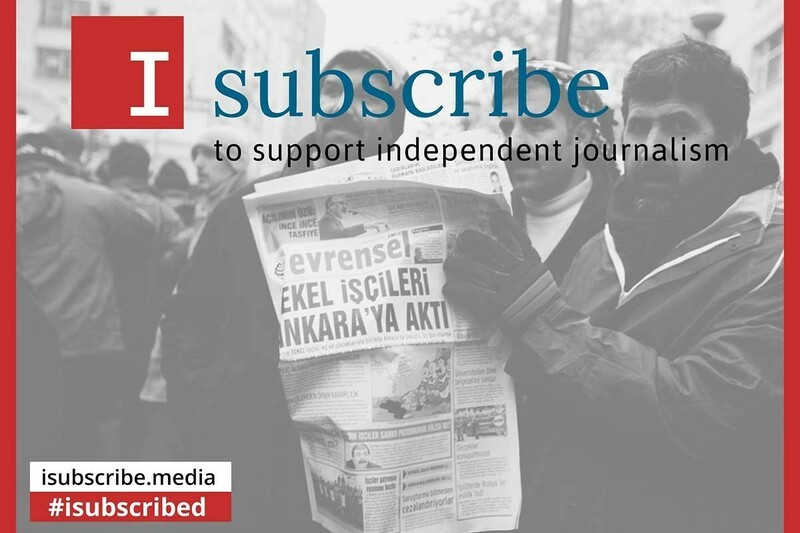 Even as we spoke the AKP had begun taking steps to shut down news agencies and alternative publications, including Cumhuriyet, Evrensel Kulture, Ozgurluk Dunyasi and Tiroj. At the time of writing attacks have intensified against the elected HDP members of parliament, including the co-leaders of the Party Selahattin Demirtas and Figen Yuksekdag who were arrested and detained when their homes were raided on the evening of 3 November. All attempts at democratic opposition are now under siege, as such the work of SPOT is more important than ever before. Create a dialogue between the anti-war movements in the UK and Turkey. Provide regular updates on the treatment and conditions of refugees in Turkey. Create a workers’ charter to advocate and promote workers’ rights in Turkey. Organise and publicise a campaign to demand an amnesty for trade unionists imprisoned. Promote the rights of the women workers who are being forced out of workplaces and replaced by men. Identify companies in the UK which have links with the Turkish government and companies – lobby and advocate for an end to the attacks on workers’ rights. Organising meetings to discuss the issues of the workers in Turkey – this could be both standalone meetings as well as through trade union conferences. Invite trade union and workers to UK to give their account of workers’ rights in Turkey. Organise trade union delegation to Turkey to meet with union representations in Turkey. Write to journalists, authors and academics in Turkey to express solidarity with them and their struggle for peace and democracy. Promote their work and introduce them to the British public through meetings, events and promotions. Continue working with freedom of expression campaign groups to put pressure on the Turkish Government to release arrested academics, journalists and elected representatives. Work with academics and human rights campaigners to ensure that trials of opposition academics, journalists and elected representatives are monitored. Developments in Turkey have not been dealt with in detail in this report, and, needless to say, there are many aspects of the struggle in Turkey, including LGBT rights, women’s rights and environmental campaigns. SPOT is keen to hear from groups and individuals passionate about these causes too and would welcome opportunities to support the work of specialists and experts in these fields. For more information and to sign up to our bulletin please contact us via email (spot@daymer.org). Alternatively follow us on Facebook or twitter (@spotturkey).